The College of Saint Benedict and Saint John’s University led a national audience of faculty, senior college administrators, trustees and policymakers on July 11-13 in discussion about the challenges and opportunities facing liberal arts education. 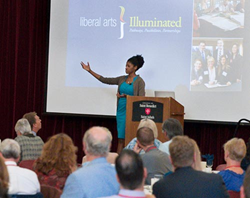 Dr. Zakiya Smith, strategy director at the Lumina Foundation, presents during the Liberal Arts Illuminated conference. Liberal arts colleges are more important, and more practical, than ever, but they face enormous and unprecedented challenges – challenges related to their purpose, their role, their value and, ultimately, their sustainability and vitality as institutions. The conference theme was “Liberal Arts Illuminated: Pathways, Possibilities, Partnerships,” and was hosted by Presidents Mary Dana Hinton of CSB and Michael Hemesath of SJU. Presidents Hinton and Hemesath noted in the conference welcome, “Liberal arts colleges are more important, and more practical, than ever, but they face enormous and unprecedented challenges – challenges related to their purpose, their role, their value and, ultimately, their sustainability and vitality as institutions. There is tremendous opportunity in each of those challenges. Two-hundred fifteen people attended the conference, representing 54 colleges/universities and 20 other organizations (associations, foundations, media, consultants, firms) and included faculty, administration, trustees, students and media professionals. Where is our sector going and how is it transformative? Why should people invest in liberal arts education? How do we ensure economic, social and cultural access for all? What should we do to make sure the liberal arts thrive over the next 50 years? Social media coverage of the conference can be found on Storify, and links to stories about the conference and the liberal arts are available at Liberal Arts in the News. The conference was hosted by the College of Saint Benedict and Saint John's University with support from the Association of American Colleges and Universities, the Association of Governing Boards of Universities and Colleges, the Council of Independent Colleges, Academic Impressions, the Corella and Bertram F. Bonner Foundation and the Minnesota Private College Council, with special funding from U.S. Bank, The Lawlor Group, Baker Tilly, William F. Knese and Suzan-Oda Crokin Knese, and Lee and Vicki Morgan.